Manavala Mamunigal (1370–1450) was a Hindu Sri Vaishnava religious leader, who during the 15th century in Tamil Nadu, with the help of his eight disciples helped spread Sri Vaishnavism. The disciples of Mamunigal established places of learning to teach Sri Vaishnavite Vishishtadvaita philosophy in Tamil Nadu. Manavala Mamunigal was born in 1370 at Alwarthirunagiri in Tamil Nadu. His parents were Tigazhaakkidanthan Tirunaveerudaiya Piran Tadar Annar and Sriranga Nacchiyar. His father was the son-in-law and also a disciple of Kollikavala Dasar, a junior disciple of Pillai Lokacharya. His parents named him Azhagiya Manavala Perumal Nayanar (beautiful groom) after Ranganathan of Srirangam. Mamunigal was schooled by father and maternal grandfather, who taught him the Vedas, Vedanta and the Divya Prabandam. He married at the age of 16 and moved from Sikkil Kidaaram to Azhvar Thirunagari to become the disciple of the acharya Thiruvaimozhipillai. Thiruvaimozhipillai was instrumental in reviving the archa thirumeni (idol) of Ramanuja at Azhvar Thirunagari and in building a temple for him. He put the young Mamunigal in charge of the temple and gave him to title of Yatheendra Pravana in recognition of his devotion to Ramanuja. It was around this time that Mamunigal wrote "Yathiraja Vimsati”, which is considered to epitomise the very essence of the exalted ‘iramanusa nootrranthAdi’. On his deathbed, Thiruvaimozhipillai instructed Mamunigal to learn and propagate the Sri Bhasya and to spend most of his time in propagating and preaching the arulicheyal (Divya Prabhandam) of the AzhvArs. He also asked Mamunigal to stay at Srirangam and perform service to Ranganatha as his predecessors had done. Mamunigal was inconsolable on the death of his master. He immersed himself completely into studying and delivering discourses on Divya Prabhandham and rahasyas. Word of his abilities spread and he gained various disciples. Prominent among them was Sri Azhagiya Varadar who undertook sanyasashrama (asceticism) from Azhagiya Manavalan. The sanyasa name was given as "Ramanuja Jeeyar" (also known as Ponnadikkal Jeeyar). Thus began the most illustrious jeeyar mutt in the Sri Vaishnava sampradaya, the Vanamaamalai mutt, that continues the great unbroken lineage of acharyas to this day. Intending to fulfil the wishes of his acharya, Mamunigal and his disciples left for Srirangam, spending some time at Srivilliputhur, the birthplace of Aandaal, on their journey. Srirangam at that point was facing the worst consequences of the Muslim invasion that took place in the early 14th century. It was structurally dilapidated, sacramentally bare, intellectually barren and spiritually, socially and morally corrupt. Misuse of rights, corruption and disorder were rampant. Nayanar had to exert tremendous effort and bring to force his divinely inspired organizational skills to restore the original pristine glory for daily sacramental and festival procedures at Sri Rangam, without antagonizing the people who were functioning in different capacities at that point in time. He realized the importance of bringing the focus back to the essential tenets of Sri VaishNavam and achieved this objective by bringing to fore scholarly works of Acharyas that had hitherto been pushed into the background. As a matter of natural consequence stemming from his commitment, devotion, erudition NayanAr was put in charge of everyday temple administration as well as anointed the leader for all Sri Vaishnavas of his time. With normalcy returning to Srirangam, Nayanar set on a pilgrimage to Kanchipuram, Thirumalai and Sriperumbudur, after seeking permission from Lord Ranganatha. Nayanar paid his obeisance to Lord Srinivasa at Thirumala and reached Kanchipuram. At the request of his disciples to glorify the Lord of Kanchi, he composed " Devaraja Mangalam" which praises the glory of Lord Varadharaja in thirteen sweet verses. At Sriperumbudur, Nayanar worshipped Swami Ramanuja and sought his blessings to formally study Sri Bhasya under an acharya. Ramanuja directed him to Kidambi Nayanar, a descendant of Kidambi Acchan. Nayanar exhibited his erudition and scholarship by grasping the intricacies of Sri Bhasya deftly and then simultaneously expounding it to other disciples. 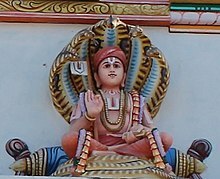 The discourse took place at Yathothkari temple at Tiruvekkaa, where his idol is seen showing the vyakhyana mudra (Symbolizing spread of Knowledge) to commemorate this event. After visiting several other holy places, Nayanar returned to Srirangam to fully manage the temple affairs. He undertook sanyasashrama (asceticism) from Sri Sadagopa Jeeyar of Azhwar Thirunagari (who was his classmate earlier) at Srirangam to fully involve himself in service to Sri Vaishnavism. It was during this time he received the beautiful appellation Azhagiya Manavala Mamuni from Lord Ranganatha. Swami Mamunigal’s divinely inspired brilliance, compassion and commitment endeared him to one and all. At this point of time, some of the prominent scholars namely Koil kanthaadai annan, Prathivaadhi bhayankaram annaa, Erumbi appaa from Erumbi, a Village near Sholinghur, Appillai came and became his disciples. Manavala Mamunigal continued to live in Srirangam and involved himself completely in writing commentaries for works of Pillai Lokacharya. He wrote elaborate acommentaries for three of Pillai Lokacharya's rahasya granthas namely Mumukshupadi, Sri Vachana Bhushanam and Thathvathrayam. He also wrote commentaries on the works of swami Arulaalap perumal emperumanar - Gnyaana Saaram and Prameya Saaram. He also blessed us with his commentaries on some decads of Periyazhwar Thirumozhi for which the original commentaries of Periyavaccan Pillai were supposed to be lost. In addition, he provided the gist of Nammalvar's thiruvaimozhi in the form of poetic verses tuned in the andhaadhi metre in his magnum opus Thiruvaimozhi nootrandhaadhi. Mamunigal extolled the greatness of the Azhwars and the acharyas who wrote commentaries on Thiruvaimozhi in his Upadesa rathina malai or the gem-studded garland of instructions. His swansong, Arthi Prabandham - a work composed out of utter despair at having to live in this material world, bears resemblance in part to his earlier Sanskrit work titled Yatiraja Vimsati. After some time he returned to Alvar Tirunagari and started to write commentaries for Acharya Hrudayam. This is a seminal work written by Azhagiya Manavalapperumal Nayanar (Pillai Lokacharya's brother), which lays bare the philosophy and basic tenets of Sri Vaishnavism with words chosen from Nammalvar's thiruvaimozhi. The text was written completely in Manipravalam and when trying to teach Acharya hrudayam, Mamunigal encountered some difficulties. So he decided to consult with Ayee Jananyacharya Swami, who was a co-disciple of Tiruvaymozhi pillai. Ayee was on his way to Alvar tirunagari to meet Manavalamamuni. They both met at the outskirts of Alvar Tirunagari and returned to Manavala mamuni's residence, and the latter studied the secrets of the Acharya Hrudayam. Manavala Mamunigal wrote nineteen books known as grantha. Three of these were in Sanskrit and the rest in Tamil language and Manipravalam. Bhavagad Gita (known as Gita Tatparyadipika) - Kanchi Sri Bhayankaram Annangaracharyar Swami lists this commentary in his Sri Manavala Mamunigal Vaibhavam book (1971) as a work of Swami Manavala Mamunigal but also says it is lost forever. Independent quatrains on the Vishnu Temples of Kanchipuram, the various sanctums of the Kanchi Varadaraja Temple and the Vishnu Temples around the birthplace of Nammazhwar, Azhwar Tirunagari. It is said that, while at a very old age, Manavala maamuni discovered that part of Periyavachchaan pillai's commentary on Periyalvar Tirumozhi was missing. So he duly restored the lost portion of the commentary. It is also noted that he composed the commentary on Acharya Hrdayam with great difficulty as his health was failing. When he became very ill, preventing him from worshiping at the temple, he dedicated one Tamil stanza a day, expressing to Ramanuja his anguish at staying in this world and his eagerness to reach Vaikuntham. These collected verses became known as Arti Prabhantham, his last work. Sri Manavalamamuni is also known as Varavaramuni, Sowmyajamatrumuni,ramyajamatra muni, Sowmyopayanthrumuni, Sundarajamatrumuni, Periya Jeer, YatheendraPravanar etc. He is known as "Vichatavak Shikhamani"- one endowed with striking precision and depth and clarity in utterances. Sri Manavala Mamuni's devotional practices towards the Lord, especially the presiding deity of Srirangam, and the lineage of teachers like Ramanuja left an indelible influence on followers numbering several millions throughout India. His influence can be traced to everyday observances till this date. But he was so self-effacive that few recognise his deep influence. His eight famous disciples are known as Ashtadiggajas (elephants of the eight directions). they were: Vanamaamalai Jeeyar, Paravasthu Bhattar Piraan Jeeyar, Tiruvengada Jeeyar, Koil Kandhaadai Annan, Prathivadhi Bhayankaram Annangaracharya, Erumbi Appaa, Appillai and Appillan. Prathivadhi Bhayankaram Annangaracharya's "Sri Venkateswara Suprabhatham" is widely known. In that work and in the connected prapatti and mangala stotras he says "sowmyopayanthrumunina mama darsithou the...", "Srimat Sundara Jamathru Munimanasa vasine", referring to the Lord of the seven hills as residing in the heart of Sri Manavala Mamuni. The teacher-disciple tradition has been followed for over six centuries and exists intact today amongst 74 simhasana adhipathis. ^ "History of Vanamamalai Mutt" (PDF). vanamamalai.org. Archived from the original (PDF) on 30 December 2008. Retrieved 26 August 2017. ^ "Swami Manavala Mamunigal in a historical context". srivaishnava.org. Archived from the original on 18 April 2000. Retrieved 26 August 2017. ^ "Devaraja Mangalam". antaryami.net. 2 October 2012. Retrieved 26 August 2017. ^ "The Hindu: A manifestation of Adisesha". hinduonnet.com. Retrieved 26 August 2017. ^ "Upadesa Rathinamalai". antaryami.net. 10 October 2012. Retrieved 26 August 2017. ^ "Arthi Prabandham". antaryami.net. 10 October 2012. Retrieved 26 August 2017. ^ "Commentaries and Works". srivaishnava.org. Archived from the original on 26 April 2001. Retrieved 26 August 2017. ^ "The Hindu: Outstanding works of Manavala Mamunigal". hinduonnet.com. Retrieved 26 August 2017. This page was last edited on 28 September 2018, at 18:14 (UTC).